The Shroud of Turin has been reproduced by an Italian scientist in another attempt to prove that the cloth bearing an image of Christ's face is a fake. A professor of organic chemistry at the University of Pavia said he had used materials and techniques that were available in the Middle Ages. These included applying pigment to cloth and then heating it in an oven. Tests 20 years ago dated the fabric to between 1260 and 1390, but believers say it is an authentic image of Christ. 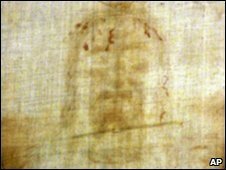 The linen cloth, measuring about 4.4m by 1.1m (14.4ft by 3.6ft), holds the concealed image of a man bearing all the signs of crucifixion, including blood stains. Tests in 1988 have been repeatedly challenged, and scientists remain unsure how the image came to be on the cloth. Scientist Luigi Garlaschelli, who is due to present his findings to a conference on the paranormal at the weekend, said many people believed that the shroud "has unexplainable characteristics that cannot be reproduced by human means". But, he added: "The result obtained clearly indicates that this could be done with the use of inexpensive materials and with a quite simple procedure." Mr Garlaschelli, funded by a group of Italian atheists and agnostics, reproduced the shroud by placing a linen sheet flat over a volunteer and then rubbing it with a pigment containing traces of acid. A mask was used for the face. The pigment was then artificially aged by heating the cloth in an oven and washing it. This removed the pigment from the surface but left a half-tone image similar to that on the Shroud. Blood stains, burn holes, scorches and water stains were then added to achieve the final effect. Mr Garlaschelli said he expected people to challenge his research. The Shroud is kept in Turin Cathedral and is rarely displayed in public.